This is my third post in as many days on Our Blessed Mother Mary. September is an appropriate time to remember the significance of Mary in the life of the Church and, more importantly, in our own lives. For as the Mother of God she is, necessarily, the mother of our own spiritual life. She nurtures us to understand that her Son is always there for us. He does not impose Himself on us and neither does Mary. They desire us to freely choose kinship with them. It is interesting to note that Mary’s name contains within it the seed of understanding who and what she means to the Church. God the Father, from all eternity, fashioned Mary in His mind to be His future daughter. The Holy Spirit, at her immaculate conception, shaped her heart, mind, soul, and body. The incarnate Son of God, Jesus, was in turn shaped by her own womb, and at the end of those nine months, gloriously born to become the Redeemer of Man. Our Catholic Catechism speaks of this when it says, “Mary, the all-holy ever-Virgin Mother of God, is the masterwork of the mission of the Son and the Spirit in the fullness of time. For the first time in the plan of salvation and because his Spirit had prepared her, the Father found the dwelling place where his Son and his Spirit could dwell among men. In this sense the Church’s Tradition has often read the most beautiful texts on wisdom in relation to Mary (confer Proverbs 8: 1-9: 6; Sirach 24). Mary is acclaimed and represented in the liturgy as the Seat of Wisdom. In her the “wonders of God” that the Spirit was to fulfill in Christ and the Church began to be manifested.” (confer paragraphs 721 – 722ff in the Catechism of the Catholic Church). Are these ideas prefigured in her name? The Church’s Tradition, from the earliest centuries, teaches that Mary was to was to be the faith-filled instrument that God would use to enable the Son of God to enter into the world of men, as man and God. She was the instrument of faith, humility and obedience that would model the skills that we personally need in order to rebel against the forces of this world, the forces of Satan, himself. Her name, along with the victory won for us by her Son, is the rallying cry for all who desire to see the forces of Satan destroyed. Her name – Mary – sustains us in our own fight, our own rebellion, against the serpent and his wily attempts to seduce us, too. Satan’s victory at the Tree in the Garden was short-lived. St. Irenaeus, bishop of Lyon in the second century, speaks of this when he says, “The Lord came visibly to his own domain and was sustained by his own creation which he himself sustains in being. By his obedience upon a tree he reversed the disobedience shown because of another tree. The seduction to which the betrothed virgin Eve had miserably fallen victim was remedied by the truth happily announced by the angel to Mary, another betrothed virgin. As Eve, seduced by a [fallen] angel, turned away from God by disobedience to his word, so Mary, receiving the good news from an angel, bore God in her womb in obedience to his word; and as Eve had been led to disobey God, so Mary obeyed him. 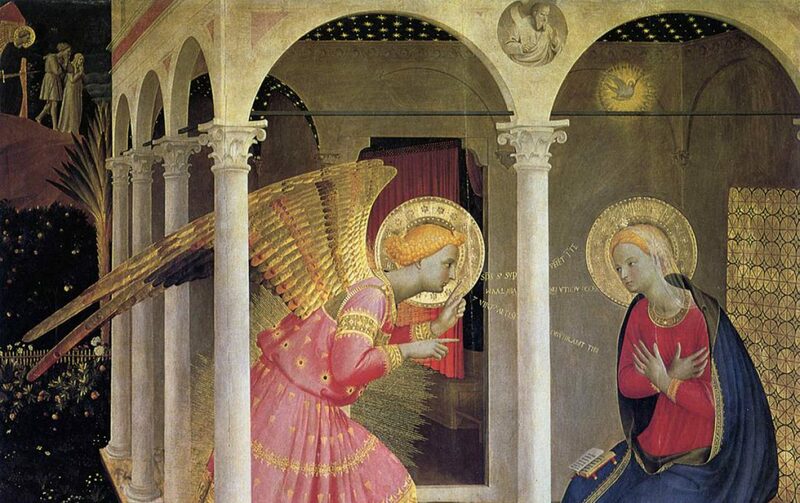 Thus the Virgin Mary became the advocate of the virgin Eve.” (excerpted from Mary’s Yes, edited by John Rotelle, O.S.A. Servant Publications, Ann Arbor, MI). The strength of her humility, faith, obedience, and prayer act as the four cornerstones to assist us in modeling our life on hers. This appeals to humble people; and indeed, the first to witness the birth of the Redeemer were St. Joseph and the shepherds. Mary is an example of faith, hope, holiness, obedience, love, and prayer. As “the Daughter of the Father, the Mother of the Son, and the Spouse of the Holy Spirit” she assists us in uniting ourselves to her Son. Her quiet strength, like many human mothers down through the centuries, enables her to meet our needs in both body and soul. We are her spiritual children. Let us run to her with all our cares, with all our spiritual and bodily illnesses, with our anxiety, fears, and despair. She is here to not only comfort us, but to strengthen us, through a multitude of graces, so that we may be powerful witnesses of faith in Christ in the spiritual war that is waging all around us. May the Holy Name of Mary always give us strength to realize that Jesus Christ is our one true Savior and the fount of all mercy. (“Daughter of the Father …etc” passage is taken from a meditation by Father Emanuel d’Alzon, 19th century founder of the Augustinians of the Assumption, excerpted from his book Mary Our Mother, Our Model, Our Queen, translated by M. Angeline Bouchard from the original French, Trente Jours avec Marie. which received the Nihil Obstat and Imprimatur of the Church). Notes on the sacred images: The first painting is by the 17th century Italian artist Giovanni Salvi (also known as Sassoferrato). The title of the painting is The Virgin at Prayer. It is in the National Gallery of Art in London. The second image is a close-up of the Blessed Mother’s face that was sculpted by Michelangelo in 1499 for his extraordinary sculpture known as the Pieta. Michelangelo was 24 years old at the time he sculpted this masterpiece! It is located in the St. Peter’s Basilica in Vatican City. I love this blog. I learn so much. It fills in the gaps in a way: in the sense of telling the stories and traditions that are not part of the liturgy and gospels: the stories of saints, the meaning of feastdays. And the photos/art/illustrations are GORGEOUS! !